If Penn State Behrend’s students have not seen their classmate Rachel Cotton on campus, there’s a good chance they’ve heard her. For listeners of BVZ: Behrend’s Voice, the college’s online student radio station, Cotton’s voice is a hard one to miss. The junior communication major serves as station manager of BVZ and can be regularly heard across the cyber waves hosting her current show, “Next in Line,” where she previews upcoming artists. She also is happy to jump in and deejay whenever there’s a lull in programming. 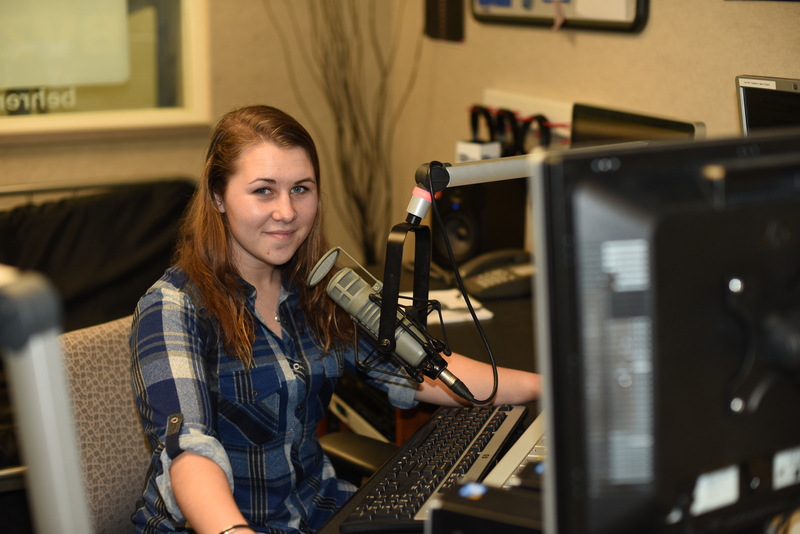 She knows that professional radio jobs may not be easy to attain, but that has not stopped Cotton from positioning herself to be an ideal candidate for a future opening in the field. Cotton’s love of radio is nothing new. In high school, she actually won a contest where she got to be a deejay on a local station for a day. She brought her love for the medium to Behrend as she got involved with BVZ, which celebrated its fifth anniversary in November, early in her freshman year. As a sophomore, she served as PR and events manager for the station before becoming its manager this past fall. In the past, students could not join BVZ or host a show on the station before first completing the Radio Practicum course, but Cotton saw limitations with this formula. This past fall, Cotton developed a BVZ Fast Track program for students who want to host a radio show but cannot take the course. Cotton meets with interested students separately and runs them through the basics of operating a live station in just a few weeks. So far, four students have participated in the program. Cotton said she eventually hopes to have 10 to 20 students going through it at once. BVZ continues to build its presence on campus as the station hosts weekly “Hump Day” broadcasts from Bruno’s Café. The station is also always willing to collaborate with student groups if the organization would like BVZ at an event it’s hosting. The station has already worked with some student groups, which Cotton said has helped BVZ spread its reach. To listen to BVZ, visit behrendbvz.org. Students interested in joining BVZ and taking part in the Fast Track program should contact Cotton at ryc5136@psu.edu. This entry was posted in Around campus, School of Humanities and Social Sciences, Student News and tagged Behrend, BVZ Radio, communications, Penn State Erie, rachel cotton, radio. Bookmark the permalink.